Many have compared the early days of the US automobile industry as being much like the technology boom of the 1990s; such was the rapidity of growth and change. Automotive executives in the early twentieth century regularly switched companies and launched spinoffs and start-ups, and this culture of cross-pollination spread innovative manufacturing and design ideas among the manufacturers. It also established an early pattern of constant bankruptcies, recapitalizations and the discovery of its charlatans and frauds. Like many automobiles of this period, Checker’s roots go back further than its original offering in the market of 1922 and is perhaps linked to one of the early charlatans. With regard to charlatans, I’ll let you be the judge as we lay out the Checker story. Most historian take Checker’s roots back to 1908, but the man behind the enterprise that would be become Checker Motor Corporation was known in the industry well before 1908.
partner to produce cars and taxis required to operate the business. Management found just the man: William A. Schaum, president of the Schaum Automobile and Manufacturing Company of Baltimore, Md. Now this sounds like a great plan, but the reality was the Mr. Schaum had never produced any cars in a commercial sense. Schaum’s business was essentially a warehouse and auto repair shop. 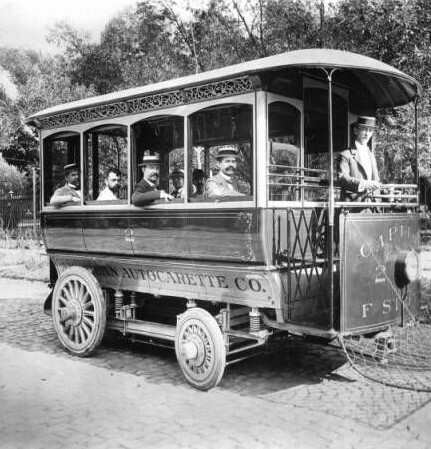 Schaum was contracted to produce ten jitneys for $40,000. Each vehicle was to be able to carry 20 passengers, ironic as the word autocarrette was defined as small car, but the actual Autocarrette taxi was a large vehicle. As soon a as the big electric taxi buses were delivered the problems began. The vehicles required constant service, the issues so significant that the entire service would temporarily shut down in September 1901 when the majority of electric motors in the vehicles needed to be replaced. In February on 1901 the city of Washington was flooded with complaints from DC residents. A report issued by the district summed up the problems: the vehicles were “unsightly in the extreme” and generated an “unholy din” in the neighborhood. What would ultimately become a chronic problem for Schaum: litigation ensued, it was initiated against him for repayment of the $40,000.00 for his horrible in-operables taxis. 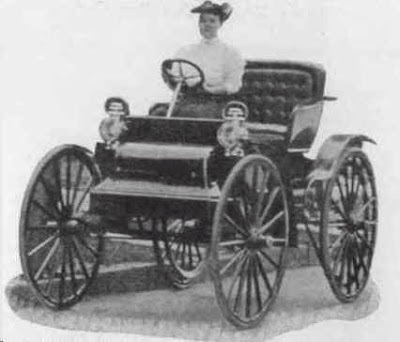 By 1902 Autocarrette was no longer in business but Schaum did continue to produce automobiles. Schaum produced 16 runabouts, equipped with a one cylinder engines operated with a chain drive. Probably the most interesting feature of Schaum’s runanbout was that the vehicle were not equipped with brakes. More interesting, yet never explained was Schaum’s claim that the runabout would be able to stop without brakes!. By 1903 Schaum would close his business and move out of town leaving behind many angry customer and investors. Mr. Schaum would drop off the auto scene for several years, but he would remerge in Buffalo in 1908 and form his second company. In Buffalo there was change, his name: William A. Schuam was now William Andrew De Schaum. More a con man than a manufacturer, in 1908 he claimed that he was formerly with C. Rossier Manufacturing, where he was credited with creating a successful high wheeler automobile; essentially a traditional four-wheeled buggy with a motor. In 1908 Motor World Magazine would describe De Schaum as follows: “Mr. De Schaum is a prolific smoker of cigarettes, De Schaum claims to have built a car in 1895 and to have completed in the first automobile race in this country: also claims to have originated the spark plug and several other things of moment”. Great claims but with a little research the claims will prove out as false. De Schaum introduced a high wheeler, named the “Seven LittleBuffaloes”, but unfortunately the high wheeler auto genre was already falling out of grace in the marketplace when compared to more innovative designs of the 1908. The De Schaum high wheeler was a two-cylinder, air-cooled, 10-horsepower open air carriage that would travel 15 mph. 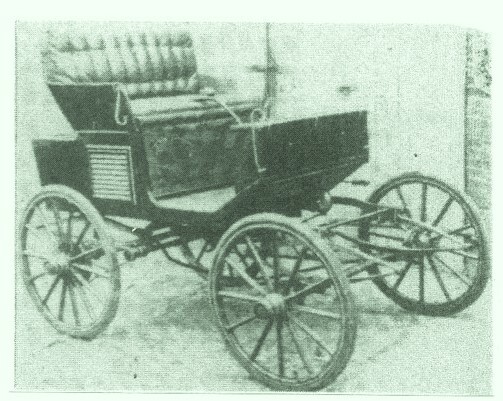 The wheelbase was 74 inches with 38-inch wheels. It had cable drive and a friction transmission at a price of $600. Unlike the 1901 Schaum runabout his 1908 car would actually have brakes. 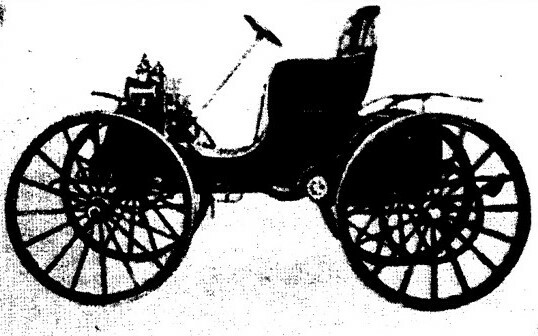 Additionally De Schaum introduced a surrey with a wheel base of 84 inches that sold for $700. With only 36 units produced, it was a total failure. De Schaum would close down this company and move on to his next project. Over the course of a year, De Schaum moved about New York State in order to find a place to build another car and open a new auto company. Eventually he would find his way to Hornell, New York. While there he would be wined and dined by Hornell city politicians and businessmen: entertained and enticed to produce his car in their humble cities, he settled in Hornell and in 1910 started a new company, the De Schaum-Hornell Motor Company. Records indicate DeSchaum incorporated his third company in New York State with $150,000 capital. This venture went nowhere, not ever producing a single car! Records show that, after fighting with contractors and business leaders he produced conflict and chaos as opposed to automobiles. Apparently the Hornell business leaders discovered that DeSchaum was broke, not having a single dime. The $150,000 of capital was a mirage, as con men do when discovered De Schaum left Hornell, never to return. attraction. It is a light car, all parts are Hecla steel and practically all under the hood. It will sell for $900.00 to $1000.00. The company is comprised of 10 Detroit business men including W. Andrew DeSchaum designer of the car, they expect to sell 500 cars next year”. It’s not clear that there was 10 actual living breathing business men involved other than DeSchaum. Also note that again De Schaum now goes by the name W. Andrew DeSchaum, his third name change and fourth car company. DeSchaum soon engaged in dialogue with the bigwigs of two Michigan cities: Wyandotte and Encorse in order to find a new place to settle and build the new cars, not in Detroit as reported earlier in 1910. The DeSchaum Motor Car Co. was reorganized in September 1911 with the same officers, into a new company, Suburban Motor Car Co. DeSchaum fifth attempt at a car company, the new concern now had ambitious plans beyond just producing cars, the new plans called for the development of a new industrial community on acreage in nearby Ecorse. , De Schaum secured capital from various Encorse investors including 230 acers of land. According to press announcements in the New York Times as well as many automotive journals at the time, the new Suburban Motor Car Co. was designed to be an impressive complex of factory buildings with direct access, via the Ecorse River, to the Detroit River and to the railroad lines that ran through to the city from the south — with an adjacent model ‘garden village’ where the employees of the Suburban would live. The Suburban Motor Car Company’s Model A-4 roadster, produced in Detroit, heavily promoted, De Schaum toured in would tale this vehicle across the country in several endurance run. At the same time, the officers separately formed the Suburban City Co. real estate firm, which shared Suburban’s Whitney Building offices in downtown Encorse. The real estate enterprise was established to promote the planned development of the 240 acres at Ecorse into the model village to be known as Suburban City. Suburban’s scheme for a ‘garden village’ was described in the trade journal, Parks and Cemeteries and Landscape Gardening, of November, 1912. Designed by noted landscape architect T. Glenn Phillips; the complex was planned to straddling the Ecorse River with acreage extending south of St. Cosme Line extending west to Fort Street. It was an ambitious development project to be sure, possibly the first of its kind in the nation. The fact that architect T. Glenn Phillips, was involved in creating the design added significantly to the hoped-for distinction and success of their plans. Phillips was also known for his landscaping of the Henry Ford home on Edison in Detroit, and later designing the campus of Michigan Agricultural College in Lansing. The Suburban Motor Company was however, a failed enterprise almost from the start. With a lack of capital and accused of mismanagement. was retained to infuse the company with more dollars. The Suburban Motor Car Company’s Model A-6 roadster, produced in Detroit, DeSchaum’s plan was to produce in Encorse, New York but research indicates none of the Suburban’s were actually produced in Encorse. 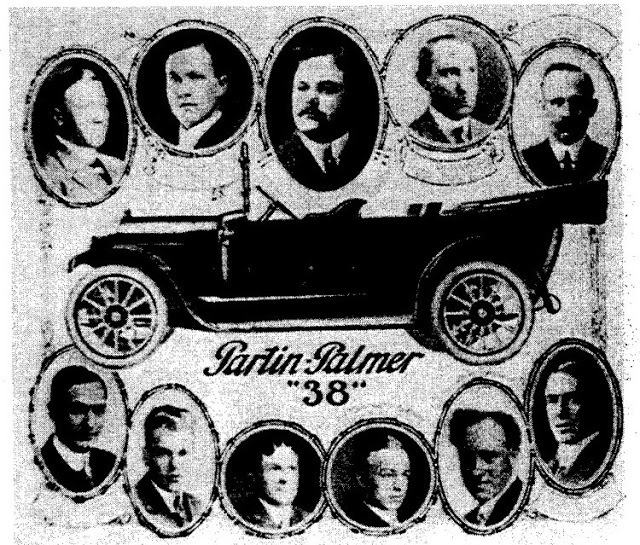 This vehicle served R.A. Palmer as the basis of the first Partin automobiles manufactured after DeSchaum was pushed out of the organization. the check he tendered for $150, 000.00 as capitalization had never cleared the bank nor was it deposited, if just sat endorced sitting in a desk drawer, DeSchaum was actually broke. The Board determined that since the check was never deposited, De Schaum never actually had an investment in Suburban Motor Cars. He resigned in disgrace on November 12, 1912. More troubling for the investors of Suburban Motor Cars was the discovery that a disgruntled employees had destroyed all the company finance records. Fortunately for Checker fans, The Suburban Motor Car Company was reorganized. Once the dust had settled and auditors were able to understand the complex financial workings, the company was reorganized. Suburban carried on as a real estate company and the various plots of land set up for Suburban City were sold off to buyers. $3000.00 of liabilities sat on the balance sheet for a small company named the Palmer Motor Co.
Randall A. Palmer of Pontiac, Michigan and former organizer of the Cartercar Company along with other interested parties leveraged that $3000.00 of debt and took over the Suburban Motor Car Company the plan was to start the real business of building automobiles. De Schaum’s cycle car project would fail too and there would be more litigation. Two years later DeSchaum would die of pneumonia never to build a car or scam an investor again. There were many unkind obituaries, in the end it was clear that De Schuam was really just a promoter conning investors out of there hard earned dollars. That said despite his failure there were still enough assets and solid prototypes to cobble together a car company. Stay tuned for more chapters regarding Checker’s humble beginnings. This is a wonderful article. I am so interested in history. Perhaps, later when you have time, you can explain how all the movies that use old Checkers, as well as other collector cars, access a source and how do they go about making arrangements to borrow them. I have a feeling that your group has been instrumental in this endeavor. My involvement in this group and originally the Checker World group, rose from my recognition of the use of a lot of Checkers in the movie “Hidden Figures”. Thank you for all your work on this site and for helping Checker lovers everywhere. This was my Grandmother’s uncle, William Schaum from Baltimore, Maryland. Interesting read.